Like many Conservatives observing Cameron’s first months as Party leader, I’ve been unsure, and on occasions uneasy about him. The only consistent thing he’s been saying is that we are to expect ‘change’. He’s indicated that General Well Being (GWB) is in his view more important then GDP, and he’s quoted as saying that ‘Compassionate Conservatism..is right for our times and our country.’ So what is this Compassionate Conservatism (CC) all about, and does the new book with that title by Jesse Norman and Janan Ganesh of Policy Exchange unlock the Cameron puzzle? After reading the summarised version of CC on CH, I approached the text with a certain amount of cynicism. The ideas sounded as if they were expressed in terms that would mean more to students of political philosophy than people from the real world. The term Compassionate Conservatism to my ear is pretentious, and has the presumption that Conservatism is on occasions not compassionate. Is CC a bit of rebranding, to go with the iceberg and the bicycle, I wondered? Putting aside such negative thoughts, I read the text. The statistical presentation is simple and to the point. 75% of those over 65 vote. Only 37% of 18-24 year olds do. In 1997 the State was 36-37% of GDP. By 2010 it will be 43%. Should it be permitted to keep rising to Scandinavian levels of 50/60%, ask the authors? Public sector productivity fell by 10% between 1997 and 2003. The quantitative picture is clear enough. If that was the sum total of the book, then people might wonder what all the fuss was about, but it is the willingness of the authors to delve into original political history and philosophy that makes CC a really interesting read. They give the flavour of Hobbes’ Social Contract, of Oakeshott’s views of States being either civil or enterprise societies, and they go back and see what these two did not mention, and what they overlooked. It was inconceivable in earlier times that States would become as powerful as modern states have become. In the past Conservatism has encompassed a broad view, incorporating Liberal Conservatism with an emphasis on free markets, localism and private property, and Paternalistic Conservatism focused on community and social stability. But there was never the thought until now presented here by Jesse Norman and Janan Ganesh that Conservatism may need to go broader still and start to protect the private and public associations and connections of individuals from state power and interference. They write, ‘In economic theory, people are treated as though they are purely self-interested seekers of profit….individuals cut off from each other, who react positively for gain and negatively to the possibility of loss.’ CC looks to see people differently, as creating their own connections motivated inter alia by affection and personal ties. When Cameron says that there is such a thing as society, but it’s not the same thing as the State, he is clearly echoing the thoughts written about and described in CC - that society is the creation of individuals, motivated to create institutions by a myriad of different things - including natural affection, and the loyalty of people to one another. It’s really a very human political philosophy, necessary as an antidote to the unchecked power of the impersonal modern State. If you cannot see Cameron’s beliefs represented in many policies yet, by reading CC which he is occasionally referencing, you will have a far clearer idea of how he approaches politics. Given the difficulty of reaching people through the filter of the media, a book like CC has a role to play in building understanding of what he stands for and how his leadership will develop in the years ahead. Henry Curteis is a businessman/writer whose publications include ‘Entrepreneurship in a Growth Culture’, and ‘Building a Creative Culture for a Growing Organisation’ part of ‘Successful Change Strategies’, Director Books. 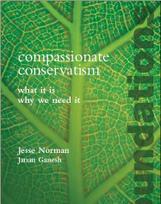 Compassionate Conservatism was serialised in four parts for YourPlatform, and is viewable in full here. There is also a review of the launch event in ToryDiary. Great, and it was a very interesting discussion on this subject at "Policy Exchange" a couple of nights ago. Finally we are moving away from "foaming at the mouth" politics and taking the time to think about and discuss the how and whys of Britain today. Excellent. This is the best thing to happen to Conservatism for eons. Tim/Sam, another very good discussion on a similar subject is "Life at the Bottom : The Worldview that Makes the Underclass" by Theodore Dalrymple.